Discover the legendary Australian Outback on a fascinating northbound journey from Adelaide, through the Red Centre and onto Darwin in the Top End. These quintessentially Australian vast and varied landscapes will astound you, as you visit the rugged Flinders Ranges, iconic Uluru and the lush wetlands of Kakadu National Park. Valid for travel: 6 Aug 2019. Day 1: Flights to arrive prior to 12.30pm into Adelaide Airport. Day 15: Flights to depart anytime from Darwin Airport. On arrival today, explore the major sights of the ‘City of Churches’. 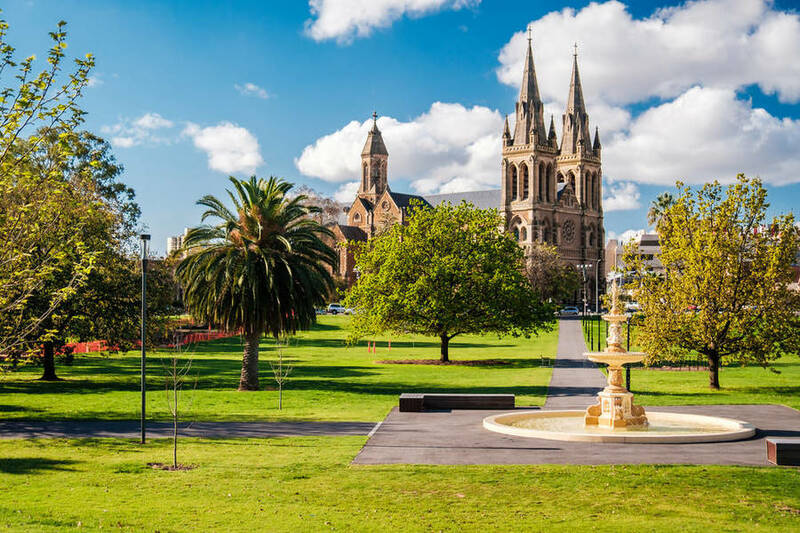 One of the few Australian cities to not have convict history, Adelaide was established in 1836 as a planned colony of free immigrants, promising civil liberties and freedom from religious persecution. Later, join a local food expert for a guided tour of the vibrant Adelaide Central Market. Meet the traders and share the history and secrets of this 140-year-old icon. This evening, relax with your Travel Director and fellow travellers at a Welcome Reception and dinner at La Boca Bar and Grill. MEALS: Dinner with wine. Today travel to the rolling hills of the charmingly secluded Clare Valley for a wine-tasting at Jesuit-owned Sevenhill Cellars, the region’s oldest existing winery. Explore the picturesque grounds and St. Aloysius Church, and take a stroll through the vines before stopping in Clare at lunchtime. Later, travel through the magnificent Flinders Ranges to Wilpena Pound, a remarkable natural amphitheatre covering nearly 8,000 hectares. Pass the intriguing ruins of deserted pastoral leases and keep an eye out for mobs of emu on the plains as dusk draws near. Today visit Woomera, an isolated experimental ground used for testing rockets throughout the 1950s and 1960s. 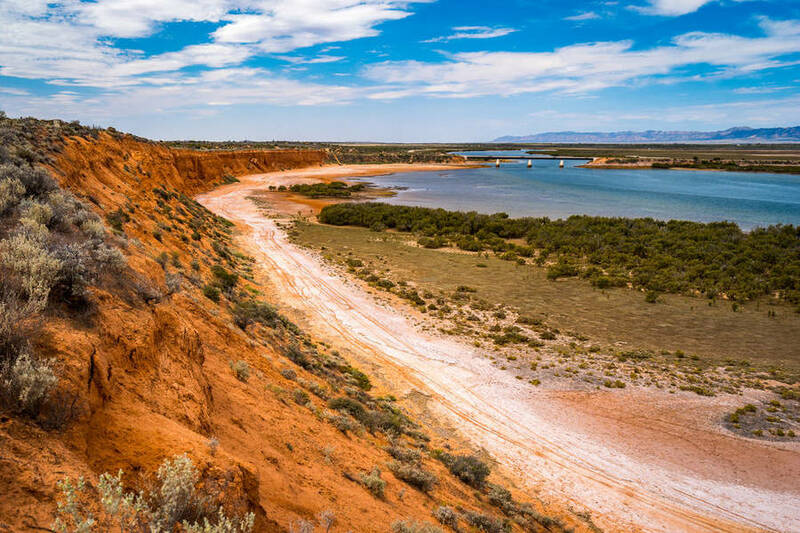 Then travel through salt-lake country and observe the transformation to a stark, barren landscape as you near isolated Coober Pedy, regarded by many as the opal capital of the world because of the quantity of precious opals mined there. Coober Pedy is world renowned for its underground residences, called ‘dugouts’, which are built in this fashion due to the extreme daytime heat. View an opal demonstration with a local guide, who’ll then lead you through some of the town’s iconic underground buildings, including a church and a private residence. Cross the border into the Northern Territory today and continue to dual World Heritage listed Uluru – Kata Tjuta National Park. Archaeological findings indicate that humans settled in the area more than 10,000 years ago. 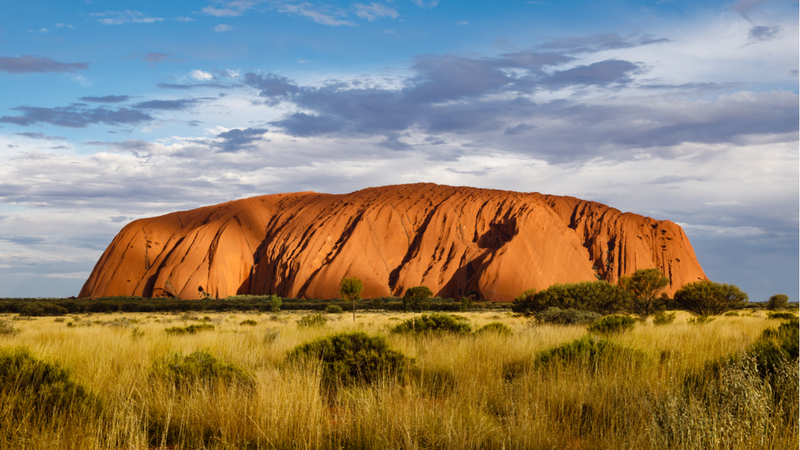 Uluru is sacred to the local Indigenous inhabitants and is thought to have begun forming around 550 million years ago. Sparkling wine is served this evening as you watch the sun set at Australia’s most renowned natural landmark and witness the spectacular phenomenon of the changing colours of the massive sandstone monolith. 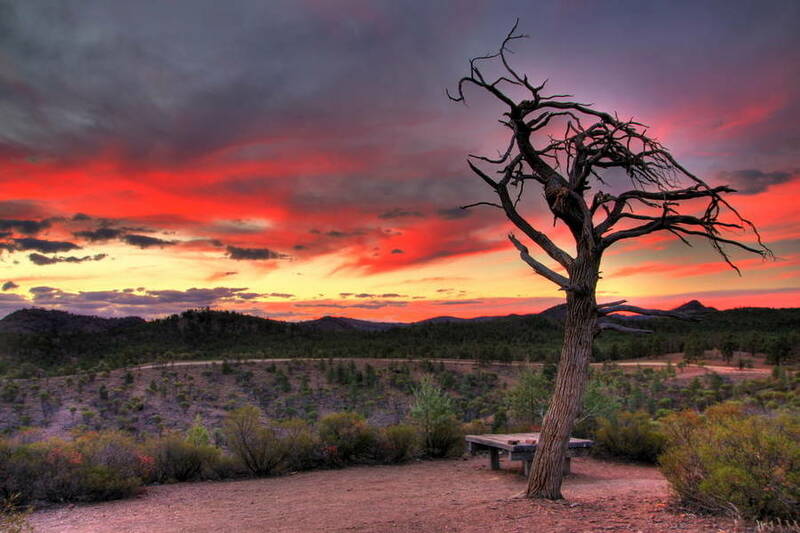 Rise early this morning to experience a majestic Red Centre sunrise. After a tour of the base of Uluru, you may like to take either a self-guided stroll around its eleven-kilometre perimeter, or a guided walk to Mutitjulu Waterhole. Your Travel Director will explain the significance of the ancient Aboriginal rock paintings you’ll encounter, and you’ll also learn about the area’s flora and fauna and the culture of its traditional owners, the Anangu people. This afternoon’s journey takes you to superb Kata Tjuta (the Olgas), thirty-six magnificent domes of red-hued sedimentary rock. The domes are thought to have originally been one huge piece of rock, much like Uluru, that has weathered over millions of years to an intriguing series of individual formations. Watch a magnificent sunset while you enjoy sparkling wine. 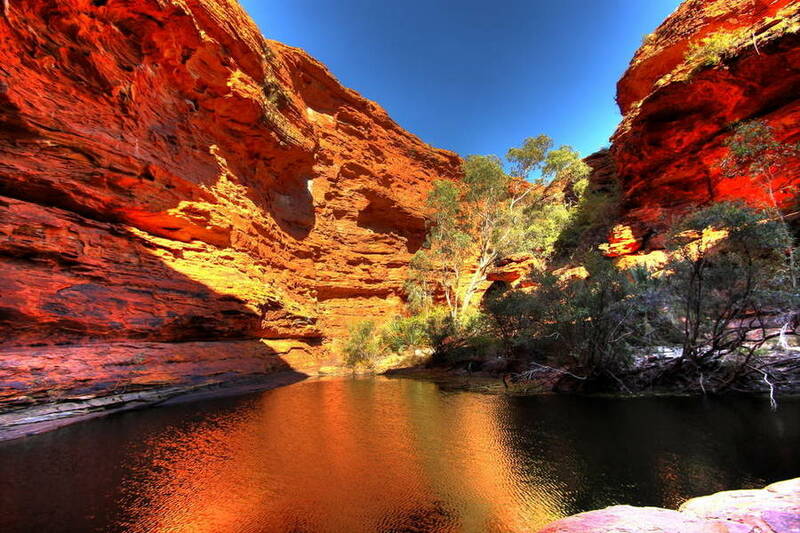 Leave Ayers Rock this morning to travel through a stark red desert landscape to awe-inspiring Kings Canyon. Stop for a lunch break at Kings Creek Station. Originally vacant crown land, the station now runs cattle and is the largest exporter of wild camels in Australia. Learn the intriguing story of owners, Ian and Lynn Conway, and their dedication to Aboriginal children in the region’s remote communities. Continue to Kings Canyon, a deep, narrow valley cut into the Earth over millennia by running water. Its ancient red rock walls soar 100 metres above Kings Creek to a plateau of rocky domes. The Creek winds through the floor of the gorge, where there is also a permanent waterhole surrounded by lush plant life. Considered one of the best and most varied walks in central Australia, the 6-kilometre walk around the rim of the canyon will reward you with marvellous views of Watarrka National Park. A shorter, more relaxed walk takes you along the sandy creek bed and leads to a lookout point affording excellent views of the towering canyon walls. Travelling past seemingly-deserted cattle properties today, you’ll develop a true appreciation for the enormous magnitude of the Australian Outback. On arrival in Alice Springs, visit the historic Telegraph Station, established in 1872 to relay messages between Darwin and Adelaide. It’s the original site of the rst European settlement in central Australia, and was one of twelve stations along the Overland Telegraph Line, which revolutionised communications on the island continent and connected Australia with the rest of the world. 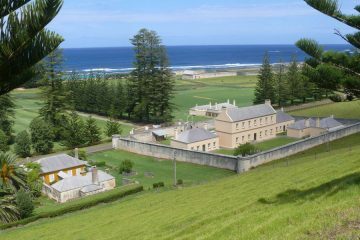 Later, drive to Anzac Hill for panoramic views over ‘The Alice’. After breakfast this morning, join a local Aboriginal guide at Alice Springs Desert Park to learn about the culture and traditions of the local Arrernte People. In the Nocturnal House, learn about the endangered animals of the Red Centre. Then enjoy a captivating Birds of Prey show. Continue to the headquarters of the Royal Flying Doctor Service to see how this iconic facility has provided emergency medical assistance to those living in remote outback Australia since 1928. This evening, join the Falzon family for a Be My Guest home-cooked barbecue dinner, and later listen as they speak of their passion for ecology, astronomy and culture. MEALS: Breakfast and Be My Guest dinner. Before leaving Alice Springs this morning, visit the School of the Air to learn how children living in the vast Outback receive their education via radio and internet technology. Then travel north, stopping to visit Karlu Karlu (Devils Marbles), an intriguing series of precariously-balanced granite boulders. Later, settle into your accommodation at the former gold-mining town of Tennant Creek. Today you’ll travel north, visiting the quirky Daly Waters Pub at lunchtime. Continue to Mataranka, where you can visit a replica of the original Elsey Homestead used in the filming of the Australian classic ‘We of the Never Never’. A swim in the crystal-clear warm waters of Mataranka thermal springs under the dappled light of the paperbark and palm forest is a must-do for travellers. Journey on to Katherine for the night. 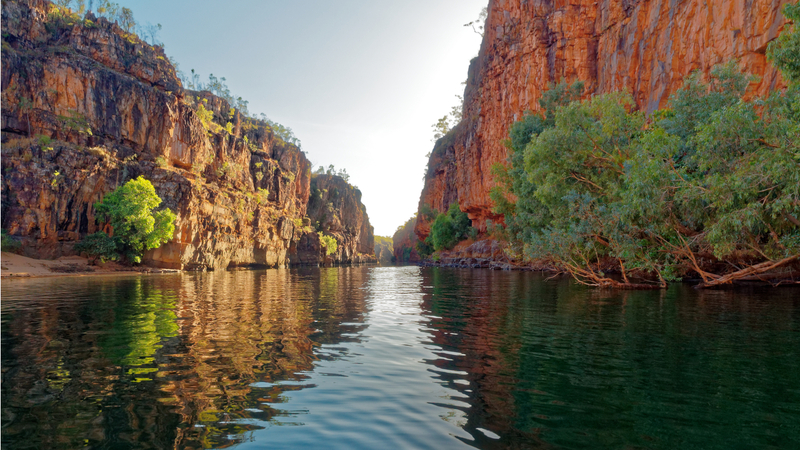 This morning, travel to Nitmiluk National Park, where a tranquil cruise along the spectacular Katherine Gorge will allow you to sense the spirituality of the land while you catch glimpses of the abundant wildlife and learn about the traditional owners, the Jawoyn people. Then journey deep into Kakadu for a cruise on the famous Yellow Water Billabong, famed for its stunning variety of birdlife including sea eagles, brolgas and tiny, brilliantly-hued kingfishers. You’ll also see estuarine crocodiles basking in the shallows and on the sandy banks. Visit Ubirr, one of Kakadu’s renowned Aboriginal rock-art sites. Walk to nearby Nadab Lookout, which affords magnificent views over the surrounding wetlands and escarpments. This afternoon in Darwin, choose from a range of Included Choice sightseeing experiences. Visit the colourful Mindil Beach Sunset Market where we’ll treat you to dinner, visit Crocosaurus Cove or perhaps sit back and relax under the stars at Darwin’s famous Deckchair Cinema, run by the Darwin Film Society during the Dry. Travel to Litchfield National Park today, pausing to examine the amazing termite mounds that are aligned north-south to minimise exposure to the sun. Stop to view Florence Falls, a double-plunge waterfall leading to a popular swimming-hole. 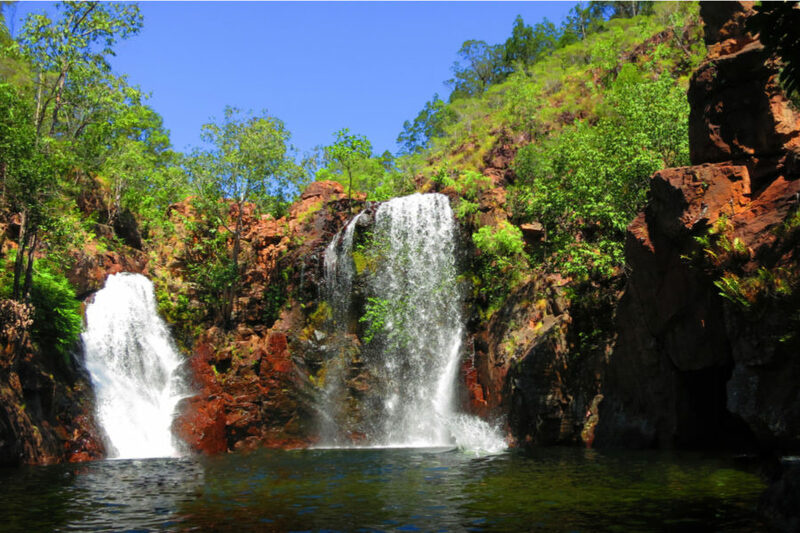 Venture on to Wangi Falls for an opportunity to swim in the large waterhole before heading back to Darwin. This evening, join your Travel Director and fellow travellers for a Darwin Harbour Cruise Farewell Dinner. MEALS: Breakfast and farewell dinner. The Outback is in a part of our backyard that should be visited! Rather than travelling to far foreign countries, you have the opportunity to discover during this tour the unique beauty and diversity of Outback landscapes from Ayers Rock and Kings Canyon to Alice Springs and Litchfield National Park. From Sydney, Melbourne, Brisbane or any other city, Jetstar, Qantas, Virgin Australia or Tigerair are the main airlines that will enable you to travel to Adelaide and from Darwin to your home city. You should arrive prior to 12.30pm into Adelaide Airport and depart anytime from Darwin Airport at the end of your tour! All transfers are included in the deal! In the arid zone (the largest outback climate), there are long, hot summers that last from around October through to mid-March. The average maximum temperature for January is often 35 degrees or more. What type of clothes should I bring? Bring comfortable walking shoes, sunglasses, sunscreen and hat, water bottle, camera and a jacket in cooler months!